NoSQL database vendor Couchbase Inc. is seeking to let developers build always-available, data-driven apps for mobile users wherever they are, even when they don’t have connectivity to the cloud. The Couchbase Mobile suite was released yesterday, featuring three components, including an embedded, small-footprint, JSON-based NoSQL database called Couchbase Lite. The new mobile database is a smaller version of the company’s cloud-hosted Couchbase Server database, also part of the suite. Now developers can build apps that store data in a device’s embedded database so they work even when a user is offline. When connectivity to the server is restored, Couchbase Sync Gateway — the third component — will synchronize the data with Couchbase Server. The company said its NoSQL database is better suited than traditional relational database management systems (RDBMS) to handle the varied types of unstructured data generated by mobile users. It claims no existing product synchronizes unstructured data shared between a device and the cloud. The Couchbase Sync Gateway synchronizes data on mobile devices when connected to the cloud. The Couchbase Sync Gateway synchronizes data on mobile devices when connected to the cloud. Along with most mobile development tools these days, the database is cross-platform. Couchbase is working with Xamarin Inc. and Adobe PhoneGap so developers using the lightweight database can easily target multiple OSes. 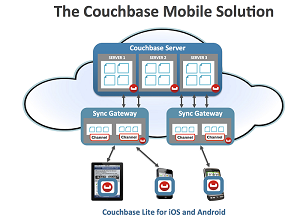 The initial release of Couchbase Lite features native support for iOS, Android and Java. Couchbase is partnering with Xamarin to provide a version for the Microsoft .NET Framework, released yesterday in beta. Xamarin and PhoneGap provide cross-platform functionality in different ways. Xamarin provides a native mobile application development platform that lets developers write C# code that is compiled for native optimization. Projects can share app and business logic, data access and networking code. Couchbase said the new offering was nearly three years in the making, with first beta version released in September 2013.